In our earlier articles we have made a brief review of the institutional and technological solutions to the present ecological crisis and also their limitations. We have also indicated a third, evolutionary remedy as a more lasting solution to the problem. This article presents a perspective, which can lead humanity safely and surely towards its sustainable future. The evolutionary agenda we will be presenting here requires two basic cultural changes: rethinking Nature and rethinking Development. The first step has to be a rethinking of our cultural attitudes to Nature. Ecological awareness is an inherent and inbuilt instinct in the ancient mind. It is a religious instinct based on reverence and worship of the sustaining source of their life. In some of the more mentally and spiritually advanced cultures like India and China, this ecological instinct developed further into an aspiration to understand and live in conscious attunement with the laws and rhythms of universal Nature. Modern ecology is only a partial recovery of this ancient wisdom at the physical level. Partial because, in the ancient Indian and Chinese thought, Nature is not only physical, but also psychological and spiritual. Man is a part of Nature not only physically but also psychologically and spiritually. Nature is not only our material Mother from whom we draw all the physical energies needed for our material and economic development but also our eternal divine Mother of the world who is the source of all energies in Man and Universe, in all levels of existence-physical, psychological and spiritual. Each part or level of our human organism-physical, vital, mental and spiritual-derives its energy from the corresponding levels or planes of the Cosmic Nature and is governed by its own unique set of laws. Thus, there is a greater and a more integral ecology beyond the ecology of the physical Nature which remains yet to be explored. 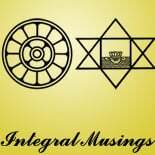 The aim of this integral ecology is to arrive at a holistic understanding of the laws of human and universal Nature in all the dimensions-material, psychological and spiritual-and explore their mutual interactions, similarities, differences and correspondences and their practical implications for human wellbeing and progress. This cannot be done entirely by the scientific and rational mind. We must have the spiritual intuition of the seer, sage and the mystic. If we don’t have it, we have to draw upon the spiritual wisdom of the past and present and based on it, use our rational, scientific and pragmatic mind to arrive at a flexible framework of thought and practice, action and application. Interestingly Sri Aurobindo, looking at human evolution from a deeper and broader spiritual perspective had come to a similar conclusion when he wrote in one of his early writings: “In the next great stage of human progress, it is not a material, but a spiritual, moral and psychic advance that has to be made” (6) or in other words Development of Consciousness. If this view is accepted, then the future of sustainable development lies not in economics, technology or even in ecology but in applied psychology and spirituality, which will lead to the moral psychological and spiritual development of humanity. This means priorities of sustainable development have to shift from material, economic and ecological sustainability to psychological and spiritual sustainability. This will not be difficult because there is a much greater affinity between ecology and spirituality than between ecology and economics. Ecology and inner development can be a mutually reinforcing combination. Inner development in the psychological and spiritual domain can lead to a deeper and inner communion with Nature, which in turn can bring a deeper suprascientific insight into the physical as well as the supraphysical dimensions of Nature. Similarly, a disinterested pursuit of the study of ecology or the ecological paradigm in thought, feeling and action can lead to an inner contact with the universal intelligence or consciousness behind physical Nature, which can open the doors to spiritual consciousness. And the modern science of ecology has discovered two great spiritual principles at the physical level. First is the unity of Man and Nature, and second is the connectedness and the interdependence of human life. If the outer life of humanity is organised according to these principles, with a clear understanding of the moral and practical implications of these principles, then it will create a favourable outer environment for the inner, moral and spiritual development of humanity. Let us now briefly summarise the positive consequences of this inner development for arriving at an enduring solution to the ecological and economic problems confronting our planet. As the human consciousness grows inwardly and feels more and more the deeper and purer joy of inner fulfillment it will act against the desire for a gross external fulfillment through an increasing material consumption. When I am inwardly fulfilled I don’t buy whatever I can afford nor do I crave for what I don’t have. I buy only what I need and the rest of my earning I spend either for my inner growth or give it for the realisation of a higher ideal which I believe will lead to a greater well-being of the community or humanity as a whole. Similarly as we grow in our mental, moral, aesthetic consciousness we will feel an enlightened and spontaneous sense of ecological and social responsibility based not only on the scientific understanding of the ecology of Nature but flowing from an emotional empathy and aesthetic feeling for Nature, life and people around us. As we grow into the deeper and inner layers of our psychological and spiritual being it will activate in us intuitive faculties of consciousness beyond the scientific and rational mind. This will reveal to us the deeper and higher psychological and spiritual dimensions of Nature and their laws and process, which the scientific and rational mind cannot perceive. In fact, even in the domain of material nature, can the modern scientific mind say it knows fully the totality of physical Nature? For example does it know fully what are the ecological consequences of splitting an atom or slicing or altering a gene? No true scientific mind will be so arrogant to make such a statement. As we ascend into the deeper and higher levels and acquire new intuitive faculties we will get a more total and holistic insight into unity, harmony and interdependence of life and Nature and as a result, better understanding of the consequences of our decisions and action. When the scientific, technological, professional and managerial mind of humanity acquires these higher intuitive faculties beyond the scientific and the rational mind, many of the problems related to environment, energy, economics or development, will find a quicker and better solution. And finally when the human consciousness grows more and more into the unity-consciousness of the spirit, in which we can feel our oneness with all existence, it will lead to an unprecedented level of cooperation and harmony among humanity. And no problem, in whatever domain it may be, can stand against the harmonious and focused assault of the creative energy of the human spirit. The spiritual intuition will also reveal the deepest and highest spiritual truths of Man, Nature and God in their perfect unity and harmony. This will lead to a rediscovery of the ancient wisdom which saw and adored Nature as a living Goddess and the divine Mother of us all and an altogether new paradigm of spiritual ecology. This brings us to the pragmatic question: how to achieve this higher evolution? The path involves three steps. First of all we have to evolve a synthesis of the spiritual wisdom of humanity with the modern secular values of liberal humanism, science, ecology and environmentalism. Second is to build an outer economic, social and political organisation based on this synthesis. Third, and the most important, is a system of education, which can internalize the values of this synthesis in the consciousness of the people. This cannot be done entirely by the present system of mental education. We have to evolve a new systems of education by which higher values like Unity of Man and Nature are not merely thought and felt as an idea or sentiment but become concrete experiential realities of consciousness, felt as concretely as we feel our body. There is a system of knowledge or science, which can provide the basis for such an experiential education. It is the ancient Indian science of Yoga. This entry was posted on July 8, 2013 by integralmusings in Ecology and Environment.